This wasn’t how Cleveland’s season was supposed to end. After falling short of the 2016 World Series title in extra innings of Game 7, the Cleveland Indians picked themselves up and spent the 2017 season building toward one of the most dominating campaigns in baseball history. After a meager start, they slowly began playing to their impressive underlying metrics, finally reaching their peak with an American League record 22-game winning streak in August and September. By the end of the season, they’d staked their claim as not only the best team in baseball this season,1 but also one of the top regular-season teams of all time. And in a week of October baseball, it was all over. On Wednesday night, the New York Yankees eliminated Cleveland from the postseason in Game 5 of their AL Division Series matchup, completing an epic comeback after being down two games to none. Now the Indians will have five months to ponder how they let it all slip away. 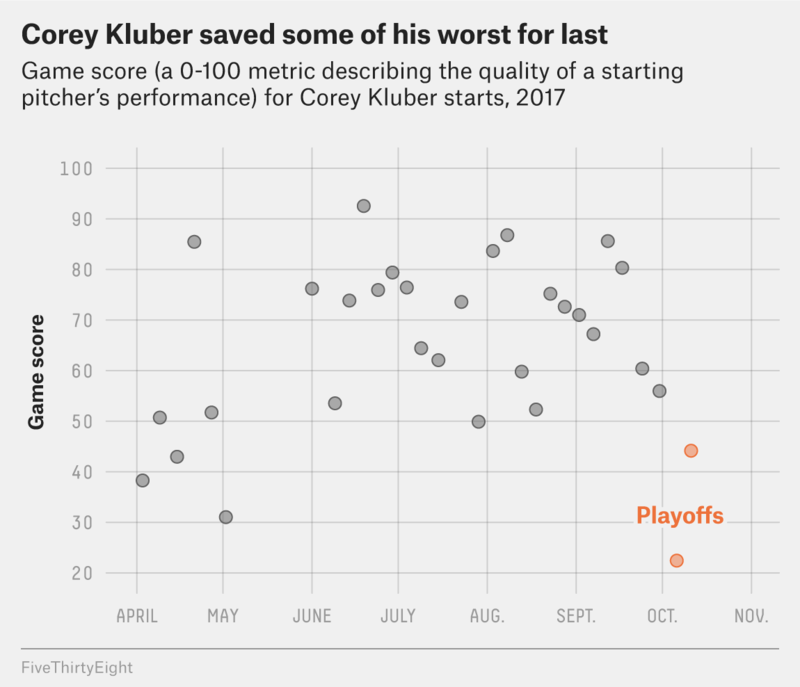 But maybe the biggest lesson of Cleveland’s quick playoff exit is that this kind of thing can happen to even the most dominant of baseball teams. According to WAR per game, the 2017 Indians were the 13th-best regular-season team of the World Series era,2 sandwiched between the 1953 Brooklyn Dodgers and the 1922 St. Louis Browns. And even among such impressive company, their postseason result doesn’t stand out. Of those top 25 teams by WAR, fewer than half ended up winning a championship. For every 1927 New York Yankees, who dominated the season all the way through a World Series sweep, there were more cases like the 1969 Baltimore Orioles — an absurdly fearsome team on paper, stacked at every position, who nonetheless were upset in the playoffs by a team with lesser credentials. * WAR is The Baseball Gauge’s custom version, which combines elements from all the major WAR variants. It is pro-rated to 162 team games. Unlike pro basketball, in which the best team wins with metronomic consistency, baseball still delivers plenty of upsets like the Yankees’ win. It’s part of what makes the sport great — even though that’s surely of little consolation to the Tribe’s long-suffering fans right now. It will be another offseason without a World Series champion for Clevelanders to celebrate. Even after 69 straight years, it never gets easier. Among other metrics, they were No. 1 according to wins above replacement — specifically, a custom meta-metric provided by The Baseball Gauge that averages together elements of the WAR variants found at Baseball-Reference.com and FanGraphs, in addition to Baseball Gauge’s own WAR metric.